Brand New Town Home In Hannon Community Of Hamilton! Built By Branthaven. 1600 Sq Ft Of Bright & Modern Living Space. 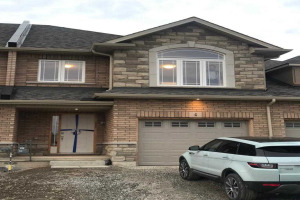 3 Spacious Bedrooms Including A Master With Ensuite & W/I Closet Plus Double Closets In 2nd/3rd Bdrm & 2.5 Baths. Main Floor With Open Concept Great Room, Dining/ Breakfast Area & Kitchen. S/S Appliances, Loads Of Cabinet/ Drawer Space, Centre Island & Double Sink, Sun Filled Rooms Throughout, Neutral Walls/Flooring. Brand New S/S Appliances, 2nd Floor Laundry Washer/ Dryer, All Window Coverings, Rough In Central Vac, Unfinished Basement, Interior Garage Access, Close To All Amenities!! !